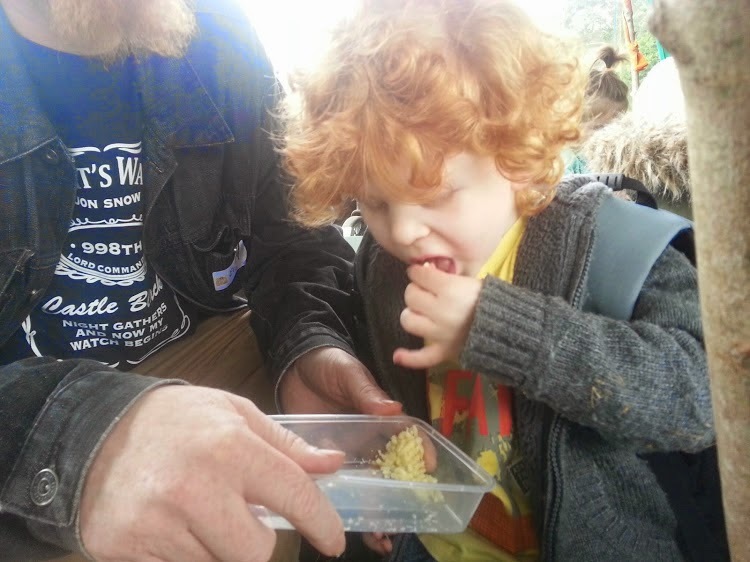 We were recently given an invite we'd have been daft to turn down - a picnic in a gorgeous forest with a storyteller to amuse the children and food provided by Roberts Bakery. It was even a nice warm, dry day. 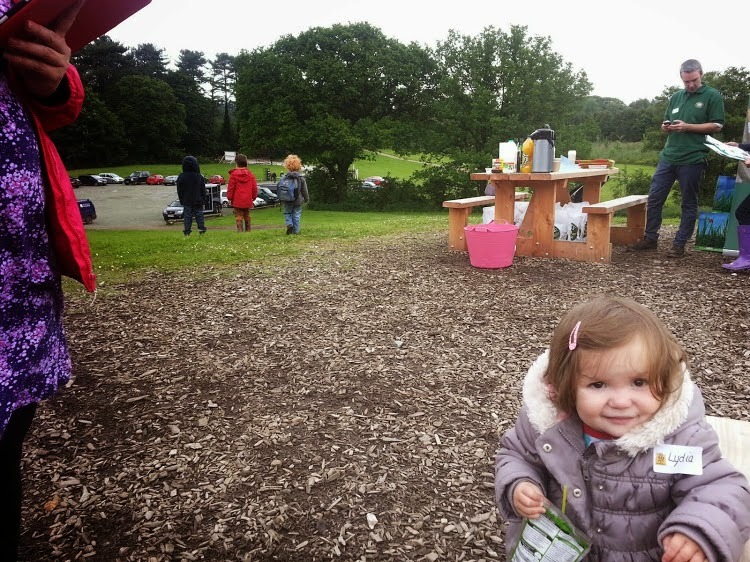 We picked up Pippa and the children from RedRoseMummy blog and drove down to Delamere Forest. 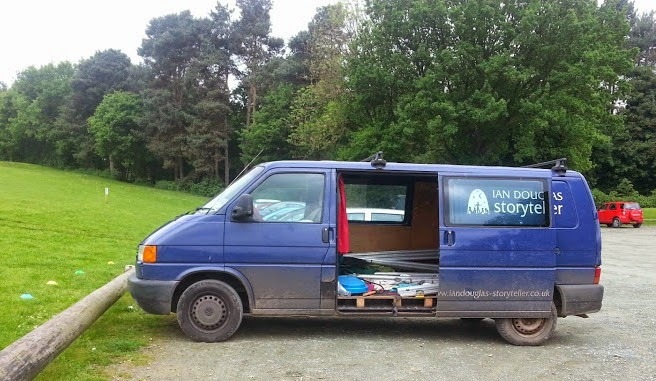 It wasn't hard to spot where we were meant to be - and the storyteller had already arrived. 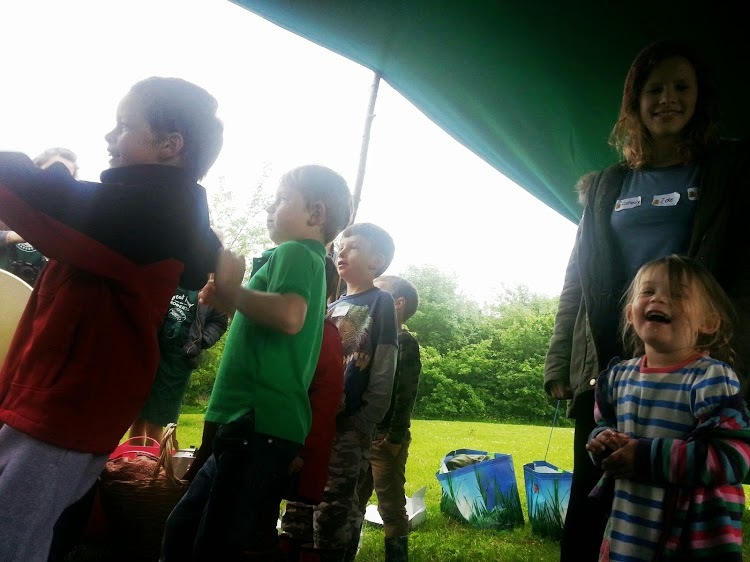 The children all had fun playing on the hill and in the nearby trees while we all made introductions and had a coffee, before we sent them off to the story tent. 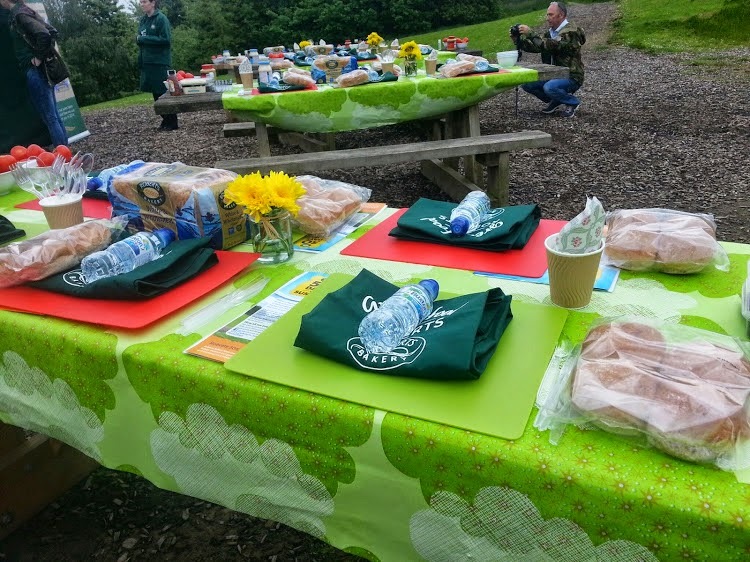 The Roberts Bakery staff had done a fantastic job of getting everything ready - the picnic tables looked amazing! We were given a short introduction and an explanation about how bread has changed. 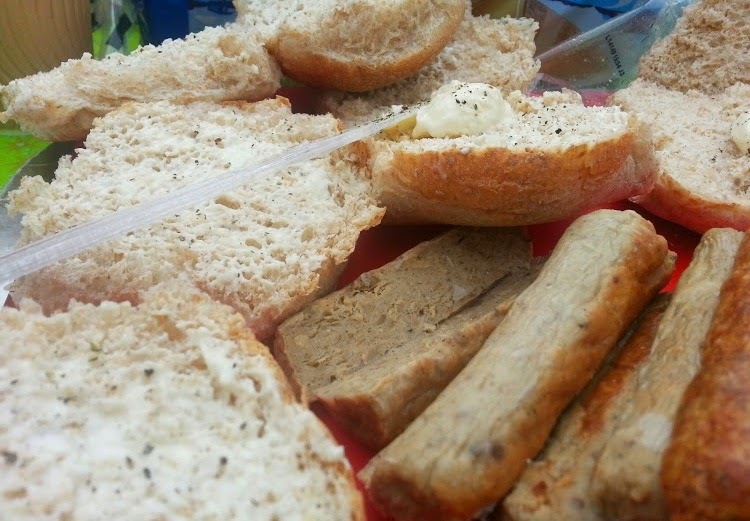 Did you know that white bread is fortified with the vitamins and minerals which are present in wholemeal? In fact, it's not so bad for you as it's reputation would have us believe. Roberts know that a lot of people (mainly children in my experience!) aren't so keen on wholemeal bread, so they've brought out a range of 50/50 bread, and will soon be introducing rolls/cobs/baps/muffins (or whatever you choose to call them depending on where you live). The Roberts Bakery nutritionist Carina Norris wants us to try something a bit different, so they had 4 different sandwich fillings for us to try - 2 savoury, and 2 sweet. 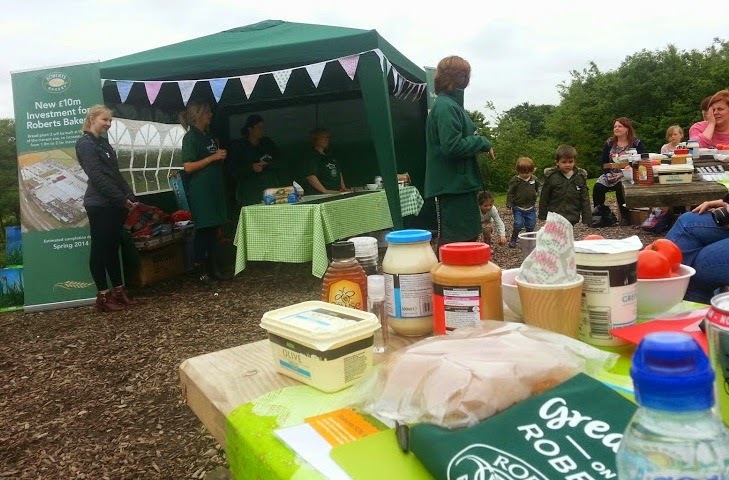 While we made our sandwiches Karol, Anetter and Mags from Roberts Bakery were on hand to demonstrate. Our first recipe was the SLT. Roberts 50/50 rolls spread with a mix of Greek yogurt and mayonnaise, and filled with (in my case Veggie) sausages, slices of fresh tomato, lettuce and sprinkled with black pepper. Delicious! 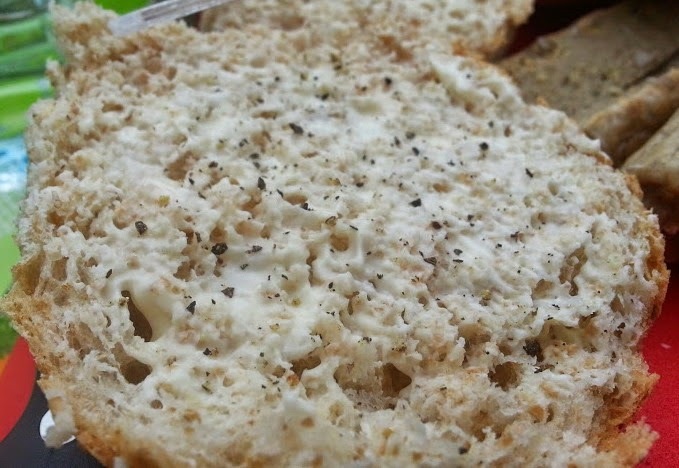 The black pepper really made the difference and it was interesting to spread the bread with something really very different. 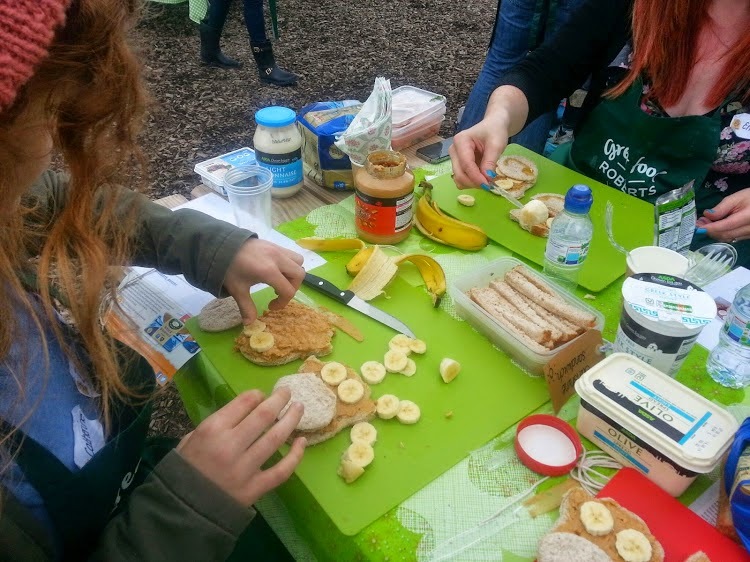 The second sandwich was one to encourage the children to eat some veg with their lunch. the Sunshine Sandwich. More usually eaten as a salad, carrot, raisins, sunflower seeds and Cheddar cheese actually makes a delicious filling for a sandwich, and it's packed with useful nutrients. We cut 3 holes in the top of ours to form a traffic light. If you want to get the colours spot on you can add sweetcorn, lettuce and tomato. Then we moved on to the sweet fillings. Strawberries & Cream was first. 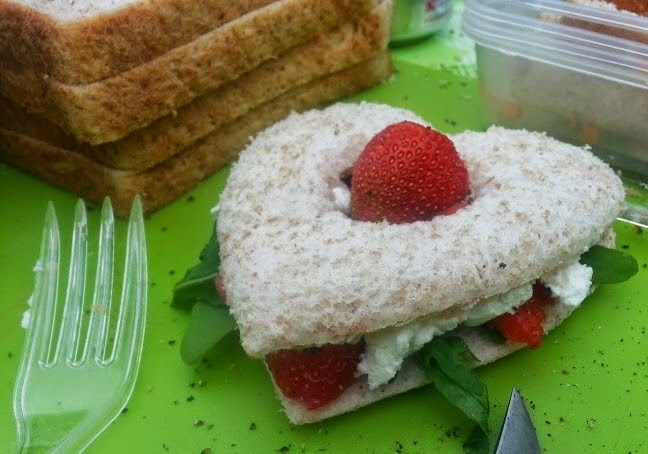 Roberts 50/50 bread shaped with a heart shaped cutter and spread with lashings of cream cheese, fresh rocket and strawberries, and sprinkled with black pepper. 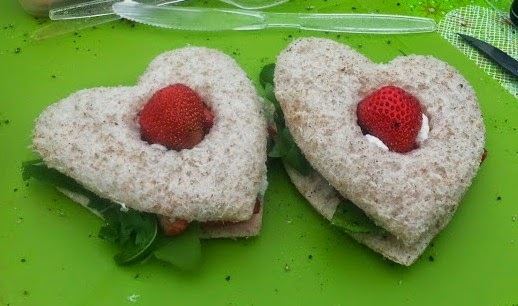 This was a really different sort of sandwich for me, although my partner has always loved strawberries and black pepper sandwiches. I have to say I'm with him now. It was fresh and not too sweet, the flavours go exceptionally well together. 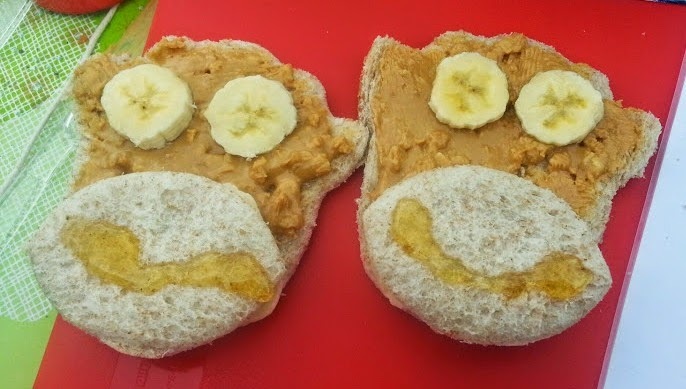 Our final sandwich was the Nutty Nana. The children had started wandering back to join us at this point, so they helped. Bread cut to shape, spread with peanut butter and banana, and drizzled with a little honey. These were very effective - although still couldn't convince my little boys to try peanut butter! 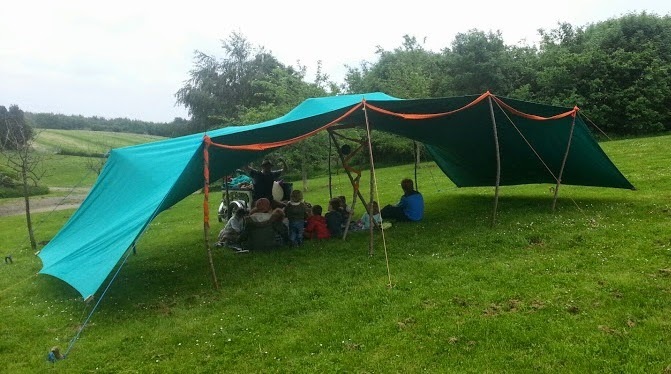 Preparation done and picnics in hand, we all went down to the story tent to listen while we ate. The children had even practised acting out a story for us to watch! I think it might have been a little embarrassing for my 14 year old, who is more than happy to join in when she's with the children, but wasn't expecting to have to repeat it in front of everyone! It was a really lovely day, and made my usual cheese and pickle sandwiches look very boring indeed. Delamere Forest is gorgeous and a picnic with friends was a perfect thing to do on a Friday in half term. 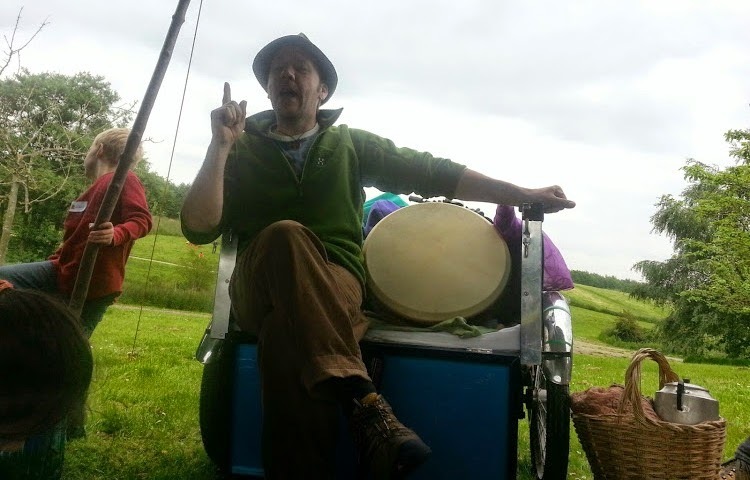 Huge thanks to Roberts Bakery for providing everything for our picnic, including Ian Douglas the Storyteller - who we all thought was brilliant! 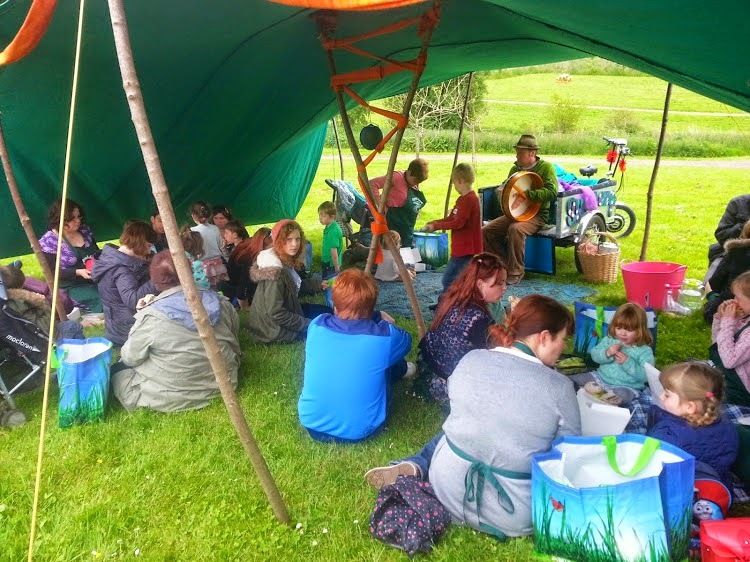 what a great thing to do, stories and a picnic. I don't know if I agree with strawberry's and pepper though. I might have to give it a try! Such a fun day! It is good to know they contain little fat and no sugar. What an amazing picnic! I love the look of the sandwiches especially the one called sunshine! :) And I bet the heart-shaped one was just as delicious :) #CountryKids. 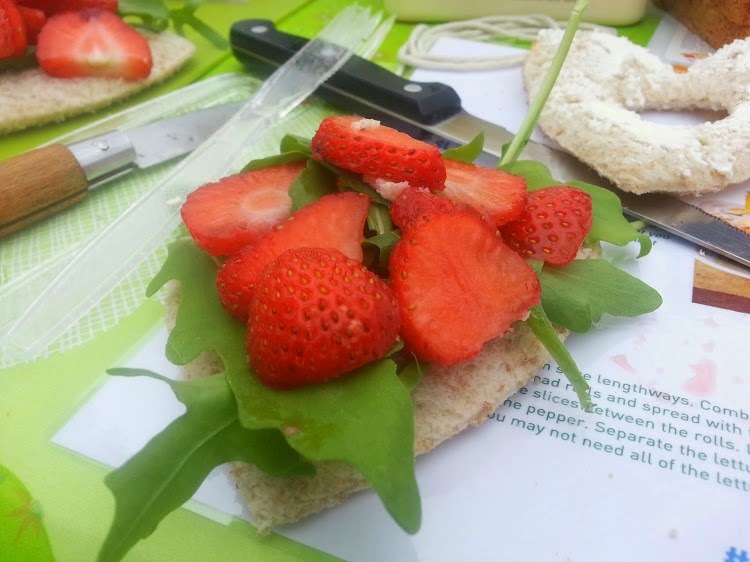 Some lovely new sandwich creations there to try - I do like the look of the strawberries and cream one. 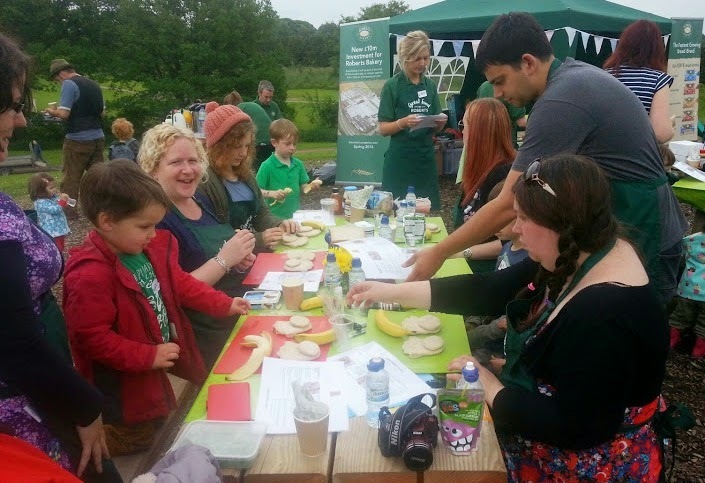 A day of fun making sandwiches, storytelling and making friends, thanks for linking up and sharing with Country Kids. Euuuw, how could you? :D My other half and a few of the kids love it, but I don't like the texture. 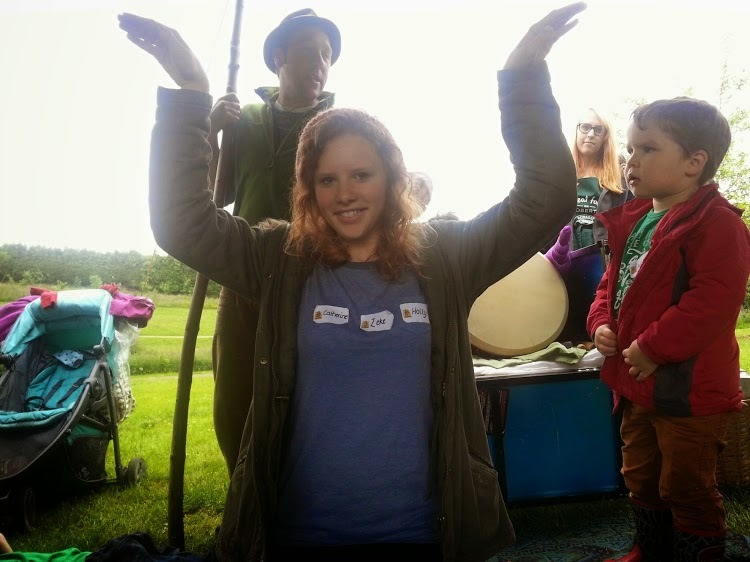 The storytelling tent is my favourite part of any outdoor children's event - so magical. 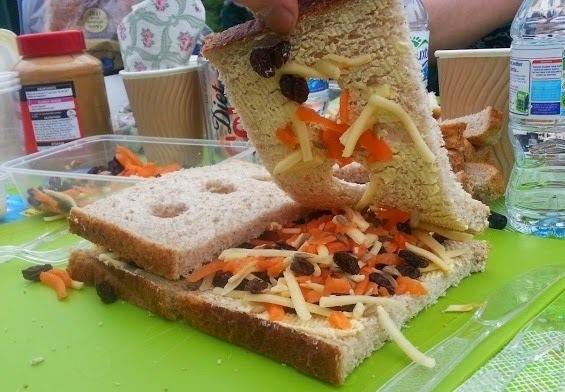 Awesome sandwich inspiration too! 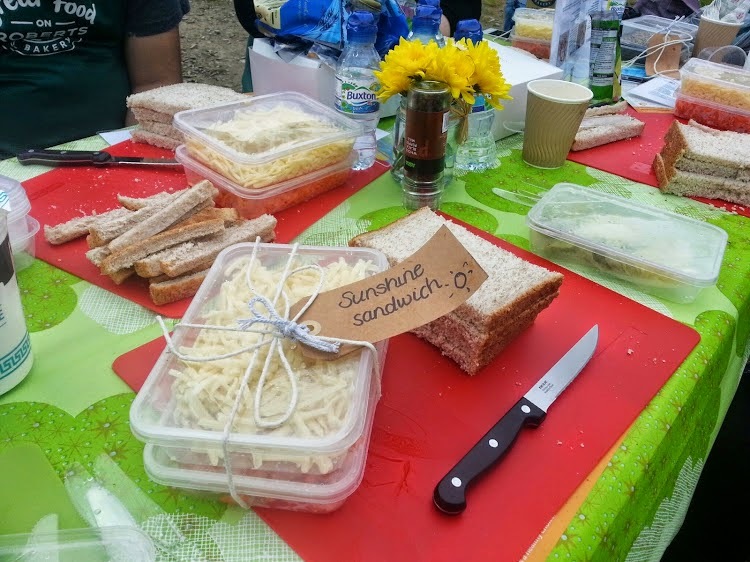 That looks like one posh picnic :) I love those sandwiches, I like getting inventive with bread too. This sounds and looks like such a great day! Loving the look of those sarnies - I'm never that creative!